As often happens in the aftermath of natural disasters, there has been increased coverage in the last month debating the merits of a 97-year-old law which affects delivery of goods to U.S. shores. You’ve likely heard talk about the Jones Act, but do you know what it is and how it affects disaster-struck areas and the delivery of transportation fuels? If not, here’s your Jones Act 101 brief. 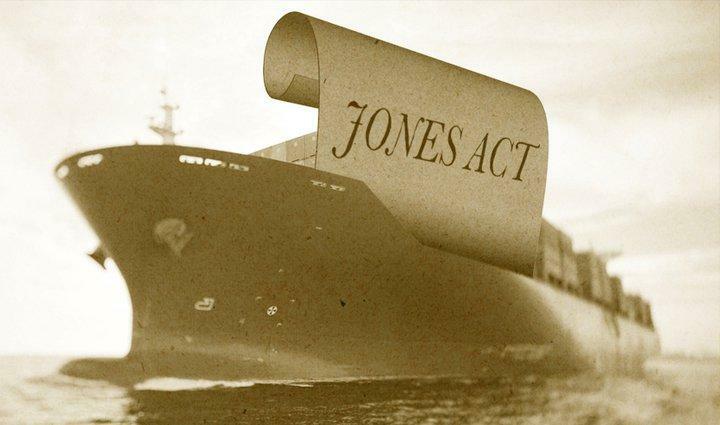 The Jones Act is shorthand for Section 27 of the Merchant Marine Act of 1920, whose primary author was Sen. Wesley Jones of Washington. It passed Congress shortly after WWI with the intent of shoring up the maritime industry after the war. The Act requires goods loaded and delivered in the U.S. to be shipped using American-built and U.S.-flagged (registered in the U.S.) ships with 75% U.S. citizen crews. It also requires that any repairs not use more than 10% foreign steel. The Act provides protection for ship builders, maritime union workers, and American commerce and provides support for national emergency contingency planning. Some argue that the Jones Act should be repealed because it creates higher shipping costs due to higher U.S. crew labor costs, the increased burden of U.S. regulations, and the greater materials costs for meeting the domestic requirement for vessel construction. According to RBN Energy, in 2015 “The cost to charter U.S. Flag Jones Act tankers that are used to transport crude and refined products along U.S. coastal waters is still as high as $75,000/day for medium-range 330 MBbl vessels. That’s four times what it costs for an equivalent foreign flag tanker.” However, as of September 2016, “term charter rates for medium-range Jones Act tankers have fallen by two-thirds since they peaked at $120,000/day in mid-2014, to only $38,000/day” partly due to increased capacity coming from newly constructed Jones Act vessels. The impact of higher shipping costs is borne more acutely by those states and territories not contiguous with the continental U.S. (Alaska, Hawaii, Puerto Rico, Guam, etc. ), where the transportation of most goods and supplies cover extensive sea or air distances (airborne freight and passengers are also subject to cabotage – trade or navigation in coastal waters between two points within a country – laws). Those favoring retaining domestic cabotage restrictions point to the need to maintain a robust shipbuilding industry with a skilled workforce capable of supporting U.S. industry and defense needs. Additionally, according to the American Waterways Operators, the Jones Act supports 500,000 U.S. jobs, and contributes $100 billion to the U.S. economy annually. U.S.-flagged shipping companies consider the coastal shipping lanes to be an offshore extension of the domestic transportation system (like rail, air, and highway). Politically speaking, there is no support to allow lower-cost foreign companies to operate domestically, displacing U.S. workers with cheap foreign laborers to operate domestic railroads, or airlines under reduced regulations and requirements. Similarly, maritime companies and laborers expect protections for their jobs and business opportunities. During periods of national emergency, the Act may be waived by the Secretary of Homeland Security. Following Hurricane Maria last month, Puerto Rico was granted a 10-day waiver to the Act and as of October 3rd, the U.S. Coast Guard lifted restrictions at all major ports in Puerto Rico and the U.S. Virgin Islands. Though there was limited interest immediately after the waiver was granted, two foreign-flagged ships took advantage of the waiver to deliver 38,000 tons each of diesel to Puerto Rico. The interest in foreign-flagged tankers has also been limited, likely due to the higher priorities to deliver food, medicine and construction materials to the island via dry bulk ships. Puerto Rico’s Jones Act waiver expired on October 9th, and has not been renewed. However, getting fuel to the island is not the main challenge at present. There are three major U.S. freight shipping Companies (Sea Star, Crowley, and Trailerbridge) who maintain regular shipping schedules to Puerto Rico, and there is no shortage of U.S. tanker vessel capacity available to make prompt fuel deliveries to the island. Additionally, much of Puerto Rico’s fuel is supplied internationally using foreign-flagged tankers. Under these conditions, a temporary waiver of the Jones Act had minimal impact on delivery of relief supplies. There is currently a backlog of freight and tanker vessels waiting to berth and deliver their cargos in Puerto Rico. Many roads and much of the transportation infrastructure have been damaged or destroyed, decreasing the demand for transportation fuels and limiting the ability to transfer fuel and other goods beyond the port facilities. According to Kirby Corporation, the Jones Act fleet used by the petroleum industry consists of three main categories of vessel. Roughly 270 coastal barges (including articulated tug barges) with a capacity larger than 195 MBbl. 43 self-propelled tankers that operate in both coastal and international waters and generally carry over 300 MBbl of crude oil or refined product.